A global trend towards differentiation within systems of higher education. Some institutions are viewed as research-intensive, others have a more modest expectation for research but a high expectation of addressing societal workforce needs, and still others are expected to provide technical education in trade, technology, and entrepreneurship. Greater emphasis on the metrics of academic access and academic success. To increase these rates in Africa will require greater variety among African educational institutions, so that students can pursue degrees that are more closely related to their unique talents and interests as well as workforce requirements. It will also require that post-secondary training be affordable to students and that counselling be available to help students enrol in appropriate programs and succeed. Long-term, it will also require a stronger pipeline from secondary schools, which will in turn require more and higher-quality tertiary teacher training and work skill development programs, both to increase the pool of teachers and enhance their expertise, and to increase employability of graduates. Increased scrutiny of African universities with respect to independent governance and public accountability. In African institutions, governance and accountability are evolving slowly. The most serious risk is that the African standards will become complex and arcane in an effort to prevent corruption, account for resources, and enhance credibility to outsiders. Although these are all important goals, excessive or awkward rule-making and various external controls on institutions will snuff out the creativity and discourage initiative that needs to be part of a transformation process. Human resources remain a key issue for universities and other institutions worldwide. In Africa, the number of faculty openings at universities may be expanding more rapidly than the pool of teachers who have conventional qualifications to teach at the university level. Because economic growth brings new and more attractive job opportunities, if the teaching profession remains unattractive, economic growth can paradoxically reduce the pool of teachers that the economy needs, by driving current teachers to other jobs that pay more and by discouraging new entrants into the profession. Financial aid to poor students remains a major challenge in all countries. Nations that in the past provided free or low-cost education are now under fiscal stress, and are seeking ways to share the cost burden that will be imposed by greater quality and access. Other countries are facing a growing concern, even among the middle class, about affordability. In Africa, there will be no expansion of higher education without considerable financial aid, whether it comes in the form of government bursaries or other forms of assistance. Sharing the responsibility (among government, students, and families) has not been effectively addressed, and it remains a challenge in Africa. In Africa and in other parts of the developing world, the proportion of inadequately prepared students has risen as college enrolments have grown faster than the quality of secondary education. This has made it very difficult for tertiary institutions to elevate their academic quality. Colleges are forced to choose between rejecting many applicants and not meeting enrolment requirements, or, as is more often done, admitting them without providing resources to help them catch up academically. Academic collaborations have greatly increased over the past two decades. International peer-reviewed academic journals are more numerous, faculty and researchers are more mobile, and global teaming is more common in major research projects. One result of this trend has been the forging of an international consensus on best practices: standards of academic quality, standards for research and professional practice, and the general structure of an advanced academic program. More than ever before African universities in particular are being challenged to transform for development relevance, and to produce more relevant and market ready graduates. They are also expected to generate innovations to support industry while at the same time being business-oriented. Belatedly, they are expected to provide the human resource and technology advances to drive the attainment of Agenda 2063. Although some of these factors may seem daunting, there are mitigating circumstances that offer genuine hope that higher education in Africa can be transformed. The higher education sector is evolving rapidly on the continent with renewed commitment for universities to produce relevant and market ready graduates with capacity to cause development on the continent. At the same time, there is urgency to cause the much needed transformation of livelihoods of the majority of rural communities who are dependent on agriculture for their livelihoods. Universities are well placed to train industry ready and innovative graduates and human resources personnel relevant to Africa’s transformation agenda. RUFORUM, drawn by a common agenda to strengthen the capacities of universities to foster innovations responsive to the transformation needs of Africa has set-out a process to develop a comprehensive 2030 agenda on Agricultural Higher Education, Science, Technology and Innovation (AHESTI). To guide the development of a comprehensive and inclusive agenda, RUFORUM seeks to engage in wide stakeholder consultations to solicit for views on what will be the critical levers that knowledge networks like RUFORUM should engage in to stimulate the much needed actions to accelerate agricultural transformation in the continent and more responsiveness from Higher Education institutions in the transformation process and policy agenda. What new thrust areas should RUFORUM focus on beyond what is currently being done? What does it mean for RUFORUM in terms of operation scale and scope? What will be the effective business model in terms of geographical footprint? What will organisational success look in mix of multiple demands requiring RUFORUM to think and act differently? It is against this background that RUFORUM is convening a consultative meeting to scope for transformation ideas, identify potential roles and organisational orientation to support these processes. To fully comprehend this transformation, there is need to reflect and visualise how a typical transformed rural African smallholder farmer will look like in 2030 and beyond. Secondly, this would require to also develop concrete strategies and actions that will lead to this transformation. In this transformation, it will be important to articulate the role of different stakeholders and strategic partners that will play a complimentary and synergistic role on this journey of rural transformation. Map out complementary actions that would need to be undertaken to achieve the vision, including the strategic partners and actors relevant in the transformation agenda. The impetus for this strategic visioning is derived from lessons from RUFORUM’s work and the trajectory outlook of national, regional and global development frameworks. 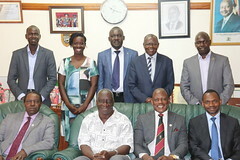 It also builds on requests from the wider development community for RUFORUM to think ahead of time and position itself to play a greater role in the sphere of AHESTI through galvanising continental voices on higher education. As part of the visioning process, a regional consultative meeting will be held in Gaborone, Botswana from 24 – 25 July 2017 at Aquarian Hotel. The meeting builds on the earlier convened regional consultative meeting held in Nairobi 19 -21 June 2017 which developed draft propositions for RUFORUM Vision 2030 that will be shared and refined. This meeting will also take the process a step further by facilitating RUFORUM to identify key stakeholders that will be required for further engagement. The immediate contact person for this consultations is Mr Charles Owuor (c.owuor@ruforum.org ), the RUFORUM Planning, Monitoring, Evaluation and Learning Manager.